Odds are, this did not turn out well. One day into Brandon Weeden's pro career and half the Cleveland fanbase is ready to high-side him for a quarterback known for his toughness and numbing mediocrity. There's no question Weeden's performance yesterday was brutally bad. Either the coaching staff did not prepare him properly or the game was moving a million miles per hour faster than what Weeden was used to, because he simply did not seem like he belonged on the field. The rookie's first pass was his best, a short slant to Mohamed Massaquoi that turned into a 24-yard gain. Weeden would only complete 10 passes after that, continually overthrowing receivers (including a wide-open Massaquoi later in the game) and looking completely lost under pressure, which had been a knock on the young QB coming out of Oklahoma State. Weeden's dubious debut was particularly agonizing due to how close the game ended up being. Even one or two accurate throws would have finished off a far more talented Eagles squad that nevertheless seemed intent on giving the contest to the Browns. Instead, it was another typically soul-crushing season-opening Sunday for the boys in the home whites, and the fickle finger of blame is being pointed squarely at Cleveland's first-year signal caller. Point all you want, Browns fans, Weeden is not going anywhere in the near future. The franchise cast their lot with the 28-year-old by selecting him in the first round of this year's NFL draft. Reach or not, 2012 is a year to find out what, if anything, the team has in Weeden before the new ownership rolls in and most likely swabs the decks of Coach Pat Shurmur and his staff. That response may not comfort those crying for the tough-minded, hard-working yet noodle-armed McCoy to make a comeback, but unless Weeden tosses another half dozen sub-10.0 QB-rating performances, he's going to be the team's main man under center for the rest of the year. And so it should be. Yesterday was not only Weeden's first real game, but also the very first time running back Trent Richardson has ever touched a football in a competitive pro setting. Weeden is working with a stable of raw receivers and an offensive line that is still trying to find its footing. Fans can argue that McCoy suffered from the same lack of surrounding talent, but he had 21 games to prove that he's better than the sum of the Browns' parts, and was unable to do so. 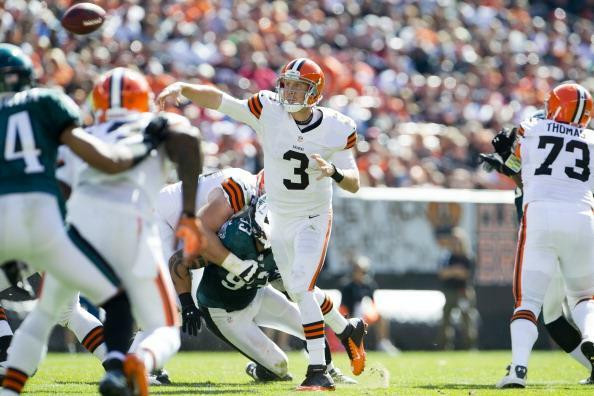 Cleveland must sink or swim with Weeden, even if it costs them games. Incredibly and rather pathetically, the team may already in line for USC's Matt Barkley. The 22nd pick of the 2012 draft needs much more time before someone makes up a stupid rhyme encouraging the Browns to tank the season ("Play Flat for Matt," maybe) or heaven forbid the coaching staff shunts him aside for a known quantity in McCoy. Yesterday's horrific showing was either an aberration or a sign of things to come. We're going to need an entire season to determine which side of that line Weeden falls upon.